ASHGABAT, Turkmenistan, November 28, 2016 (ENS) – The first-ever Global Sustainable Transport Conference concluded Sunday in the Central Asian country of Turkmenistan with sustainable transport welded into the United Nations global sustainable development agenda, showing that to be sustainable, transport must be a shared global task. At the two-day conference in Ashgabat, stakeholders from governments, the United Nations system and other international organizations, the private sector and civil society engaged in a dialogue on the integrated and cross-cutting nature of transport and its multiple roles in supporting achievement of the 2030 Agenda for Sustainable Development. The Global Sustainable Transport Conference is the first major UN Conference this year since the historic entry into force of the Paris climate agreement in early November. The two-day conference was attended by three Heads of State, one Head of Government, six Deputy Prime Ministers, two Foreign Ministers, 42 Ministers and Vice-Ministers of transport and infrastructure. Some 200 business and civil society representatives, along with representatives of over 20 intergovernmental organisations and the UN entities participated in the event. Turkmenistan’s President Gurbanguly Berdimuhamedov, who opened the conference, said his country is utilizing “consistent, action-oriented national policies” in creating a regional network and building a combined transport and communications system that will broaden access to the Black Sea, the Baltic regions, South and Southeast Asia and the Middle East. 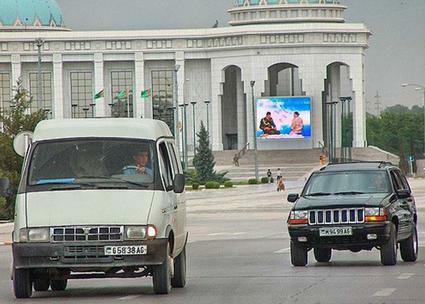 At the national level, Berdimuhamedov said, Turkmenistan has begun a large-scale development and expansion of its infrastructure, including highways and bridges, and railways with neighboring states, thereby increasing the transport potential of the country. 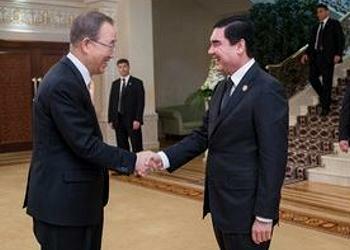 During the conference, Turkmenistan deposited instruments of accession to four agreements: the International Convention on the Harmonization of Frontier Control of Goods, the Intergovernmental Agreement on the Asian Highway Network, the Intergovernmental Agreement on the Trans-Asian Railway Network, and the Intergovernmental Agreement on Dry Ports. These conventions and agreement are intended to facilitate transport, which will contribute to the improved well-being of millions of people. “There is a consensus emerging from the discussion,” said UN Under-Secretary-General for Economic and Social Affairs Wu Hongbo at the final press conference on the results of the two-day gathering. “Simply put, without sustainable transport, there will be no lasting progress on climate action; without sustainable transport, there will be no lasting progress on the Sustainable Development Goals,” he said. Wu said that “special consideration” is needed for developing countries and countries in special situations – least developed countries, landlocked developing countries, and small island developing states. All these countries face difficulties linked to transit, inadequate transport infrastructure, missing links, limited capacities, traffic-related air pollution and road fatalities. international support, and focused investments can connect their populations and economies both domestically and globally the way that the whole world would benefit while leaving no one behind. Wu stressed the need for integration across road, rail, aviation, ferry and maritime modes, and said these different sectors need to start working together. Gyan Acharya, UN under-secretary-general and high representative for the Least Developed Countries, Landlocked Developing Countries and Small Island Developing States said there are 1.2 billion vehicles in the world, yet one billion people lack transportation. “It is difficult for countries in special situations to secure investment and partnerships to support sustainable transport and transit solutions while staying on course to meet Paris Agreement on climate change targets,” he told delegates, emphasizing the need for enhanced and strengthened global partnerships to complement national efforts and regional collaboration. Thematic discussions were also held on sustainable urban transport and sustainable transport solutions to the climate crisis. Sustainable transport is out of reach for too many rural communities, millions of persons with disabilities could not use public transportation because it was inaccessible and older persons struggled to move from one place to the next, said Ban. “Even where transport is available, it may not be safe, especially for women and girls, who often rightly fear they may be attacked,” he said. To address these and related concerns, Ban proposed the adoption of a broad view aimed at resolving interlocking problems of transport with an integrated policy framework that aligns with the Sustainable Development Goals while emphasizing safety, the environment and health. Financing is essential, he said, as it takes investments to see results, and all partners must be mobilized by putting people at the center of transport planning and by working together. A final compilation of initiatives, voluntary commitments and partnerships will be posted on the Conference website, as will the Ashgabat Statement on Commitments and Policy Recommendations of the Global Sustainable Transport Conference.